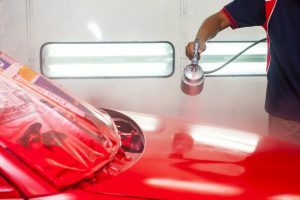 Whether your car has experienced a blemish or you are just looking for a different color or more shine, auto body paint booth services are available to solve your problem. State of the art spray booths in New York are available to expertly suit your vehicles’ needs. These systems employ curtained work stations and specialized mixing rooms. For professionals seeking to improve their auto body paint, these booths are available for purchase. These expertly designed booths will allow you to achieve blemish-free paint jobs that require little effort and rely only on the booth’s technical, precise abilities. Vehicle spray booths, such as the side draft paint booth, allow for a car’s paint coat to be achieved through a touch-less process. Exhaust is emitted through the walls on the side of the booth. This provides a top notch coat that is comparable to the prestigious downdraft technique. However, this method is cost efficient in that expensive concrete installation is not needed. This booth is easy to install and very affordable. Delivery is also quick since it is an above ground unit. For workers, having a nice, convenient work space is necessary for getting the job done quickly and efficiently. The Accudraft Prep3000 is a freestanding workstation that allows easy access for part assembly and vehicle preparation. Furthermore, this station may have curtains added to it to become an appropriate spraying area. A control panel may also be installed that would allow heat to be emitted in order for the parts to “bake” properly before color application.